Who shot Miles Archer? It doesn’t really matter. The characters and dialogue in The Maltese Falcon are so vivid that this question is ignored throughout most of the story. 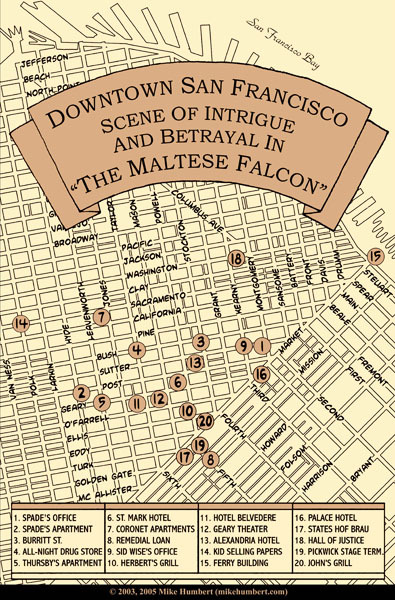 The novel's atmosphere is dense as a San Francisco fog, and its descriptions of locations are so accurate that many can been pinpointed on a map (Don Herron’s Hammett Tour visits many of these sites in person). Falcon debuted in serial form in five issues of Black Mask, between September 1929 and January 1930. 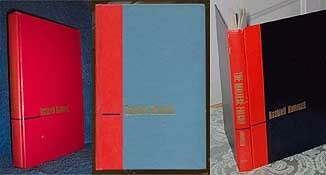 The hardback edition became available in February 1930. Sam Spade, like the Continental Op, was a San Francisco private detective. Unlike the Op, he didn’t work for a big agency; he also lacked the Op’s hard-and-fast ethical code. For a great deal of the story, it’s hard to tell which side he’s on. 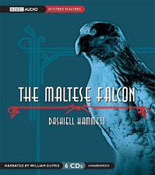 Although Hammett never managed to write the "serious mainstream novels" that he had hoped to, many consider The Maltese Falcon to be a classic in its own right. 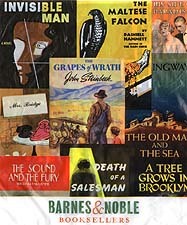 Shown here is a shopping bag from Barnes and Noble. Here we see Hammett's Falcon sharing space with immortal works by Steinbeck, Faulkner, Fitzgerald and other giants - exactly the company in which Hammett hoped he would be remembered, although not necessarily for his detective novels. 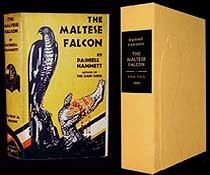 In 1957, The Maltese Falcon was included in a hardcover set of mysteries that also featured Raymond Chandler’s The Big Sleep and John Buchan’s The 39 Steps. 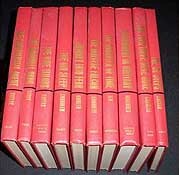 The spines were always red with gold lettering, but the color of the covers varied in some sets. 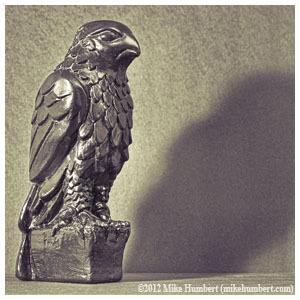 Over the years, there has been some confusion about The Maltese Falcon's dedication. Even Michael Pritchard, who voiced the Books on Tape version of the novel (and should have known better) mistakenly assumed "Jose" was a hispanic man, and pronounced it "Ho-ZAY." In reality, "Jose" (pronounced "Joe's" or "JO-see," depending who you ask) was Josephine Dolan Hammett, the author's wife. 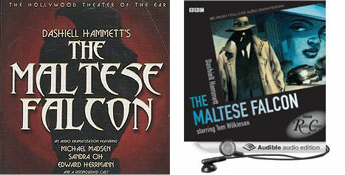 Sadly, by the time Falcon was released in hardback, the Hammetts had separated. 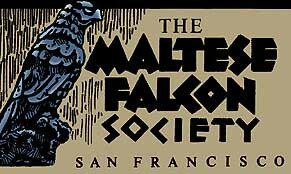 The Maltese Falcon Society was a San Francisco-based organization that existed off and on from 1977 through the 1980s. 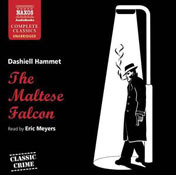 It served as a forum for fans of Dashiell Hammett in particular and hard-boiled detective fiction in general. Meeting at John’s Grill on Ellis Street (where Sam Spade dined on chops, baked potato and sliced tomatoes in Chapter XVII of Falcon), the Society had a variety of guest speakers, including hard-boiled novelist Charles Willeford. The Society folded for good in the late 1980s. The Society may be gone, but John's Grill is still "The Home of the Maltese Falcon." Their second floor dining room is a practically a Falcon museum, with many large blow-ups of scenes from the film adorning the walls. A replica of the black bird itself is displayed prominently. 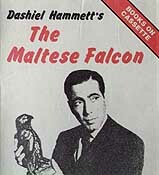 As you probably know, The Maltese Falcon was made into a classic movie starring Humphrey Bogart as Spade. What you may not know is that the Bogie version was actually the third time the novel was filmed. Click on Sam Spade to continue reading!